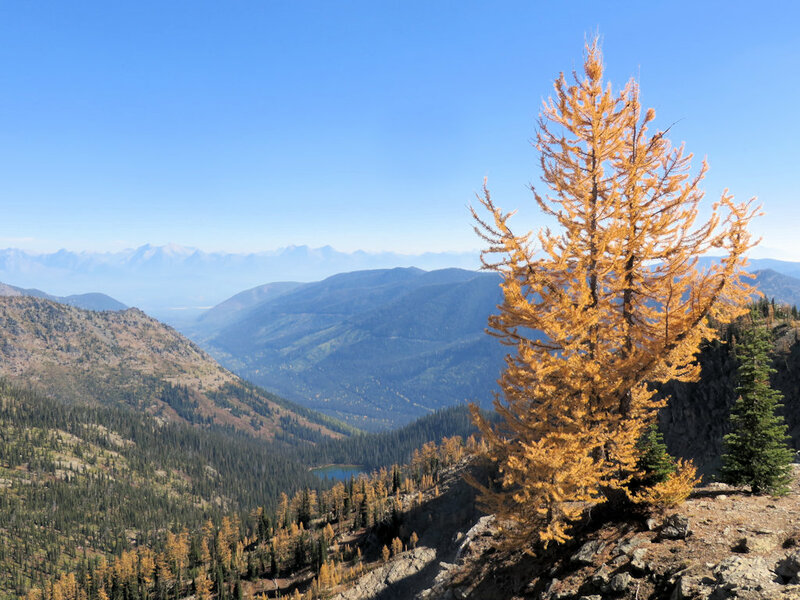 Even with a very early start to the 2015 fire season, the North Fork Trails Association was active from mid-May right through the end of October. The tinder dry forest prevented us from using any tools that might strike a spark, but we found plenty to accomplish with the one-person saws that are becoming part of our standard kit and we did quite a bit of scouting throughout the North Fork. 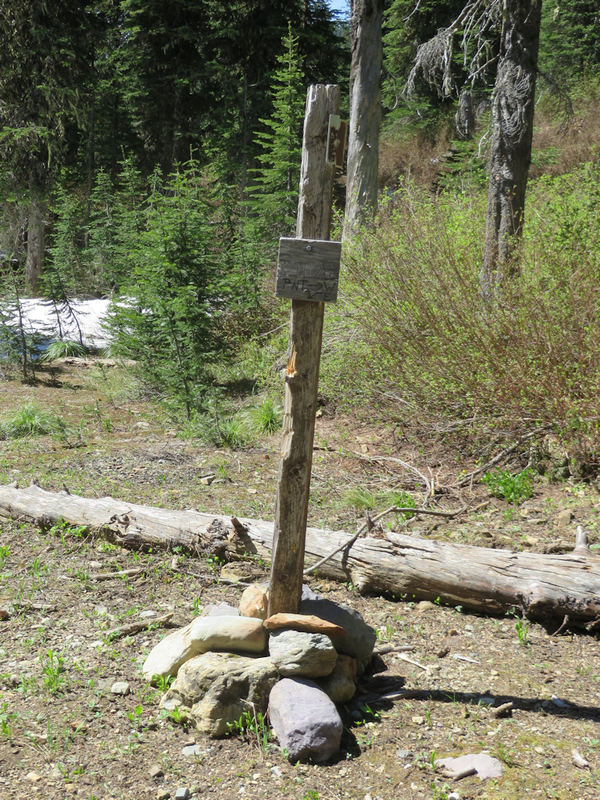 We didn’t get much snow this year so, we were able to get boots on the trail by late May. The first expedition of any size was up Trail 4 on May 26. We were up and down this trail several times throughout the year. 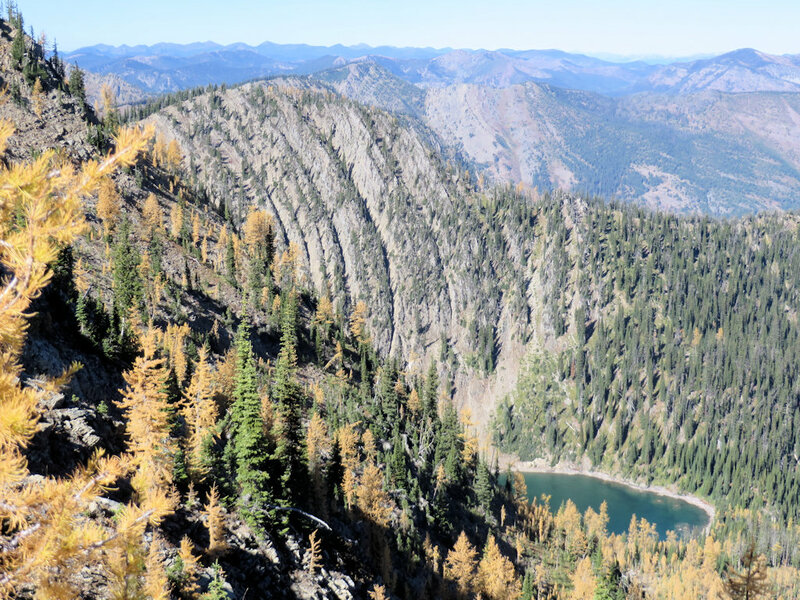 Another trail that got a lot of attention was the eastern section of the Pacific Northwest Trail where it passes through the North Fork — Trail 3 and a segment of Trail 26. It was a very early fire season. Just as we hit our stride, the region began to get smoky. 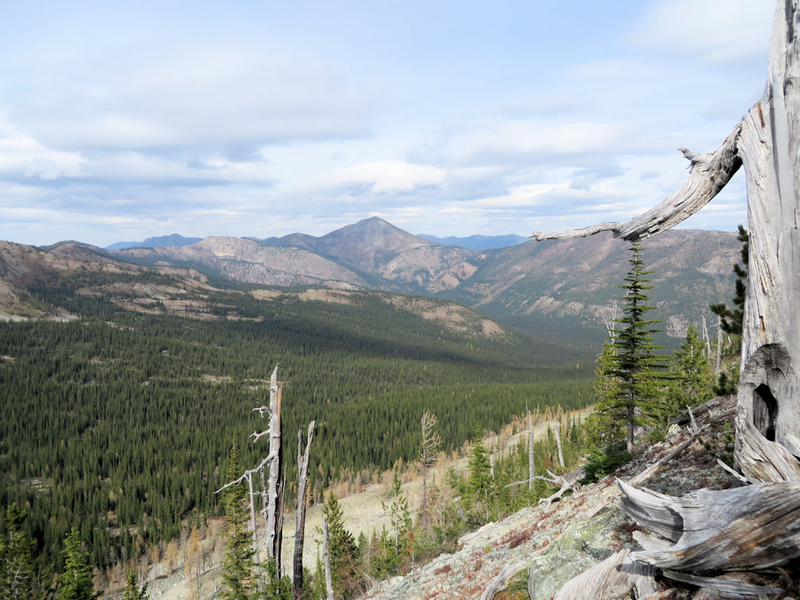 This view west along the Hay Creek drainage, was taken July 9. It got a lot worse later. The old Cleft Rock Trail, Trail 13, got a number of visits early in the season, as we checked out several ways of accessing it. (The eastern end currently stops at private land.) There will be a lot more activity on this project in 2016. 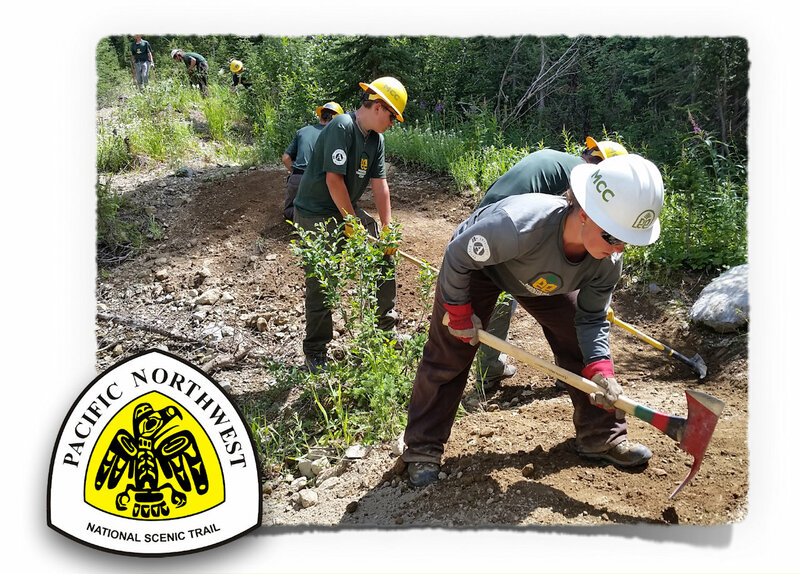 Before things got too smoky, we spent a fair amount of time in early July ensuring that Trail 2 was fixed up and ready for a “Wilderness Walks” hike scheduled for mid-July. 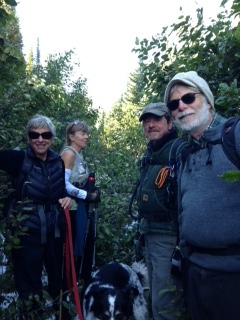 Read about the hike here and the trail cleanup efforts here and here. We’ll “draw the curtain of charity” over late summer, which was heavily shrouded in smoke from regional fires and dangerously dry. Besides, yours truly forgot to bring his camera. 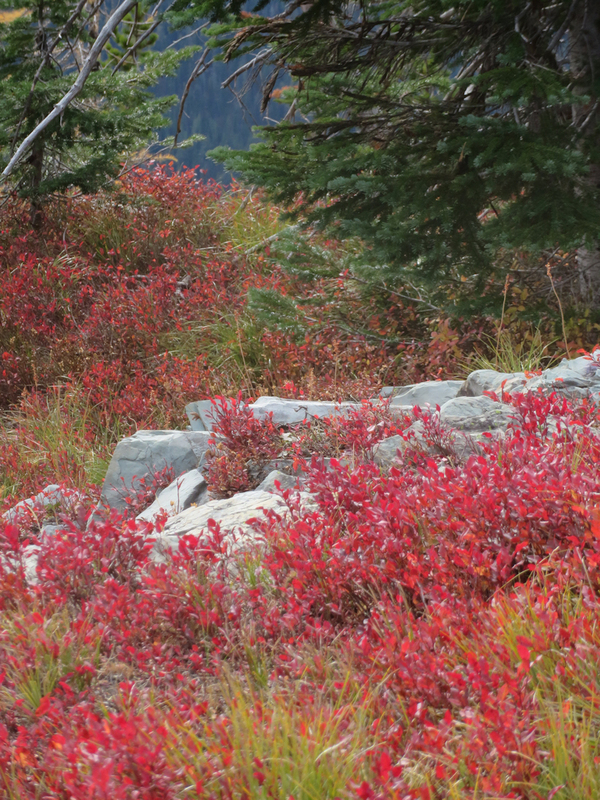 We squeezed in several late season activities, including a couple of hikes up Lake Mountain on Trail 375. The first day we went up there, the air was so clear we could see smoke rising from a wildfire near the Idaho border, almost 70 miles to the west. 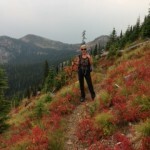 In early October we visited the Review Mountain Loop (Trails 113 and 23) a couple of times. The first trip was for our own purposes (setting additional cairns and some blow-down removal), the second was a very pleasant and productive meeting with Sean Cranmer of the U.S. Forest Service. Sean was handling trails issues this year. He took the time to drop by once the fires settled down and the smoke cleared. October 27 was the final trip to Hornet Lookout. 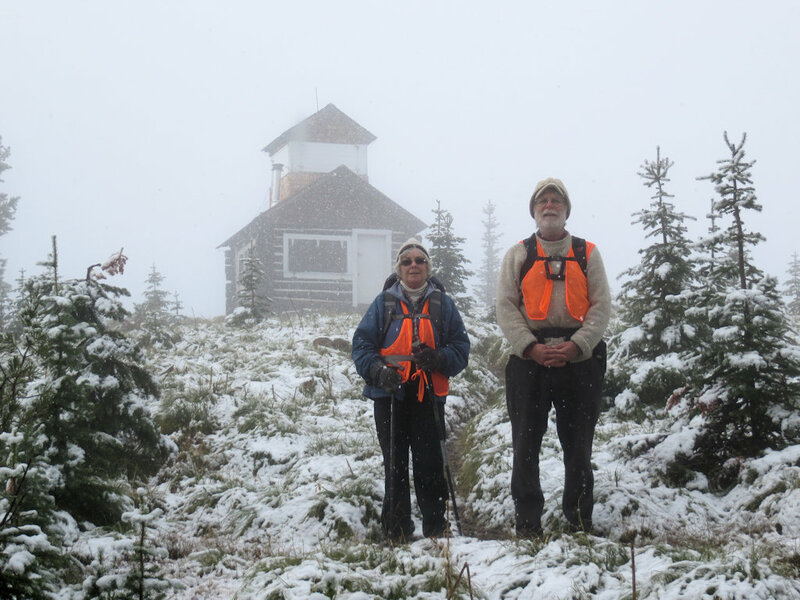 The season-ender was October 28, a last trip up Trail 239, the back door to Coal Ridge. Three of us cut out some blow-downs, excepting one that was a little big for the equipment we had on-hand, and signed the log at the Coal Ridge patrol cabin. What about 2016? We’re already rolling. Watch this weblog for further developments. This entry was posted in Images, News, Trail Reports and tagged Cleft Rock Trail, Coal Ridge Patrol Cabin, Pacific Northwest National Scenic Trail, Review Mountain Loop, Trail 113, Trail 13, Trail 14, Trail 23, Trail 239, Trail 3, Trail 375, Trail 4 on March 11, 2016 by Bill Walker. 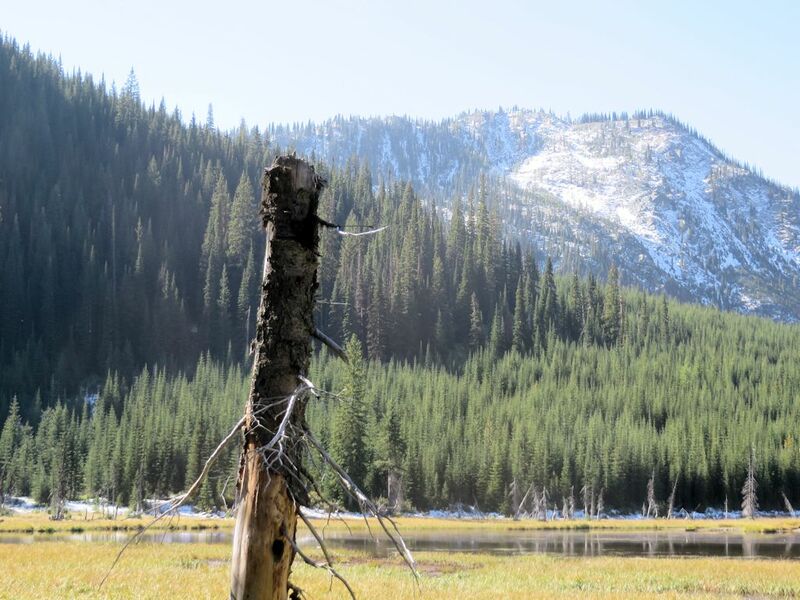 Debo Powers’ article covers our recent activity in the west end of the Hay Creek drainage, but I thought it useful to include some additional material here. Here’s a map of the two expeditions Debo mentions. 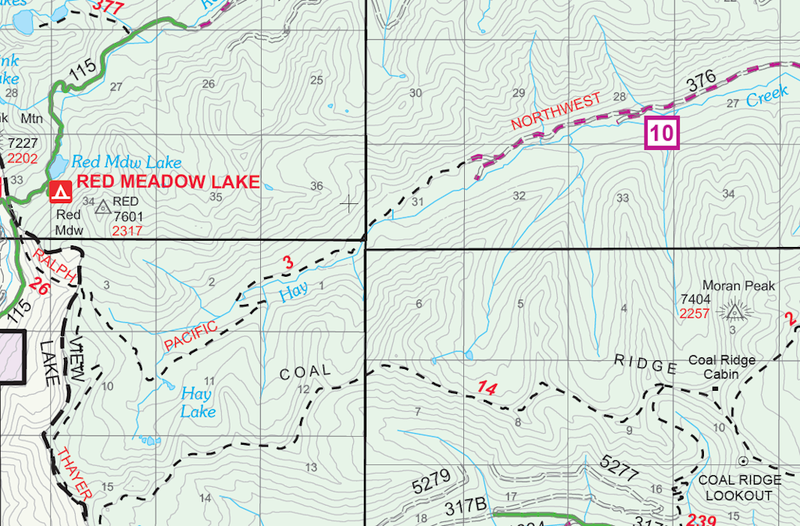 The red track is the Trail 3-Trail 26 survey conducted on September 13. 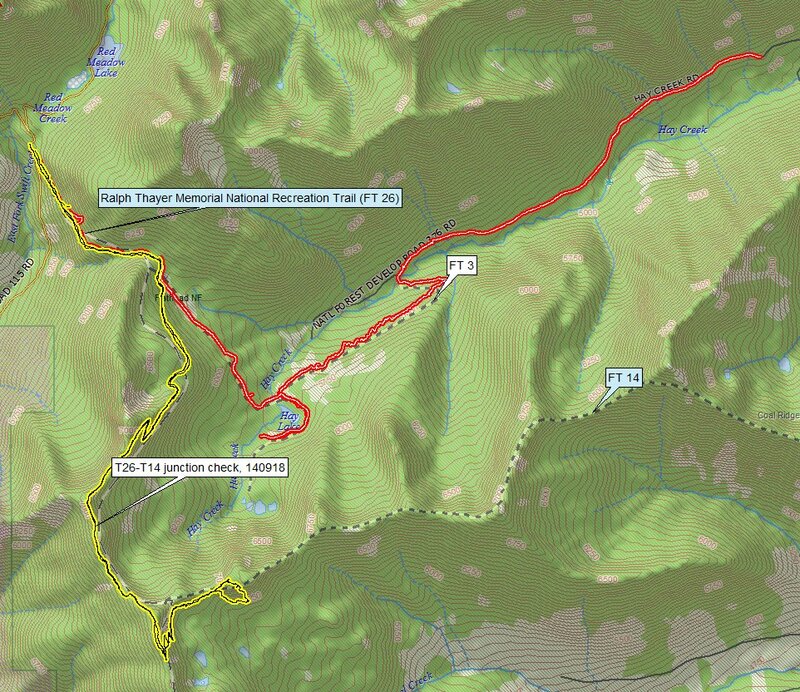 In yellow is the route of the successful September 18 search for the Trail 26-Trail 14 junction. Randy and I added about a mile to our part of the Trail 3 hike by spending some time investigating Hay Lake. Here’s Randy at the Trail 3-Trail 26 junction. 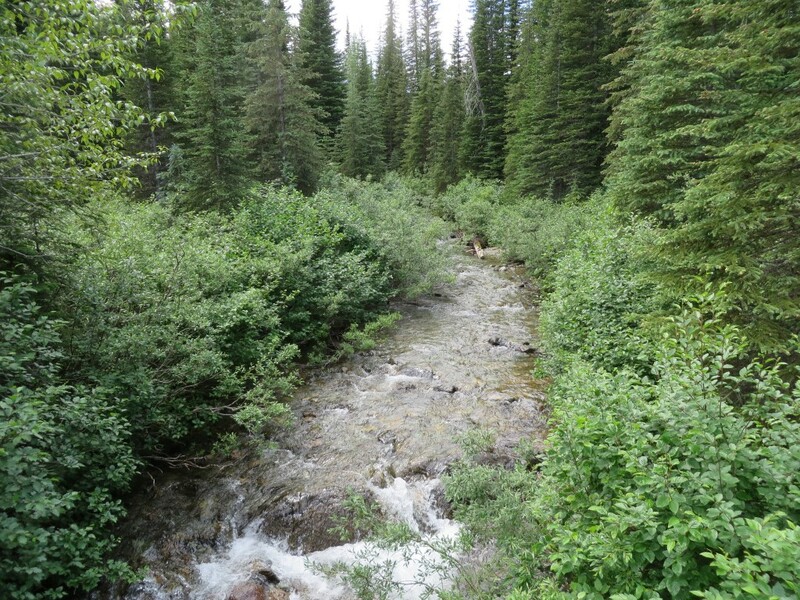 And here’s a photo of the Hay Creek drainage from the west end that I took on an earlier expedition up Trail 26. This entry was posted in Images, Maps, Trail Reports and tagged Hay Creek, Trail 14, Trail 26, Trail 3 on September 28, 2014 by Bill Walker. 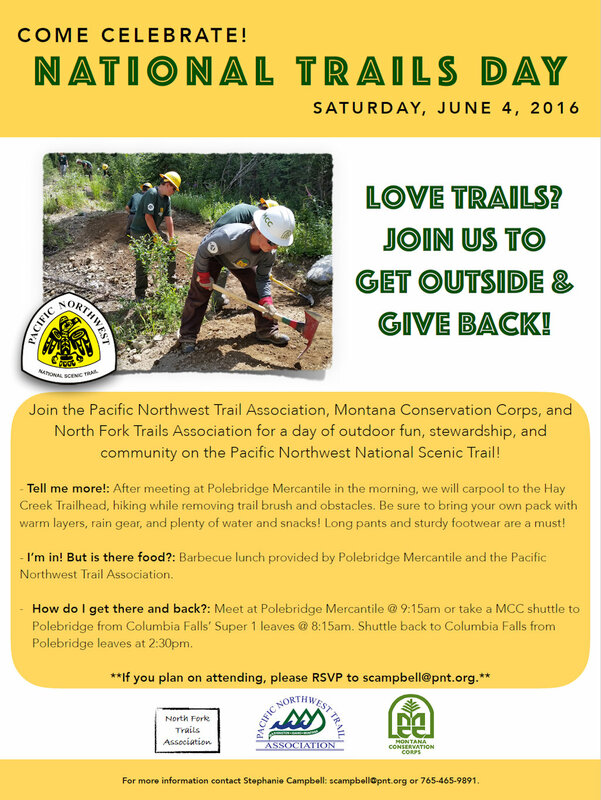 North Fork Trails Association has boots on the ground! Debo Powers wrote the following general circulation article about some of our September activities. As you’ll see, the “Three Amigas” (Debo, Margaret Heaphy and Betsy Holycross) have donated a lot of time to the NFTA this month! . . . 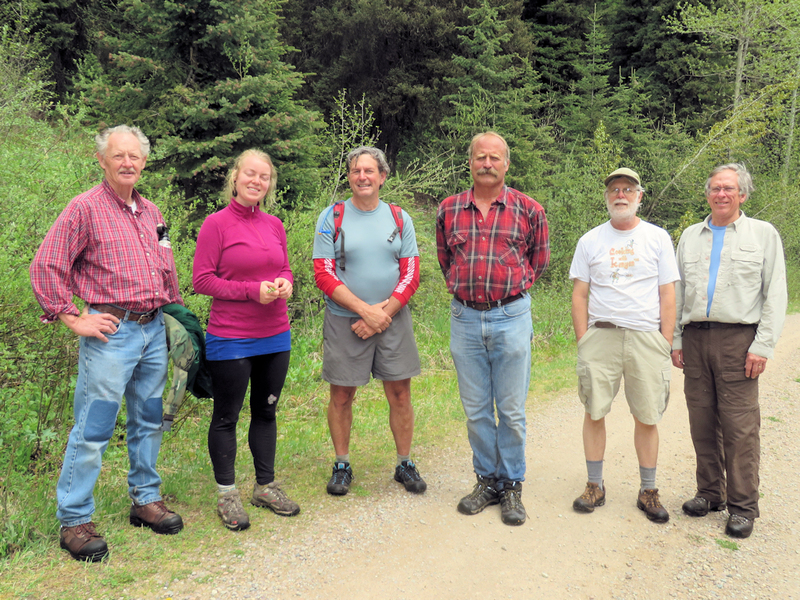 The newly formed North Fork Trails Association (NFTA) under the leadership of Bill Walker has been very busy this summer exploring, compiling information and planning for future improvement of North Fork trails. 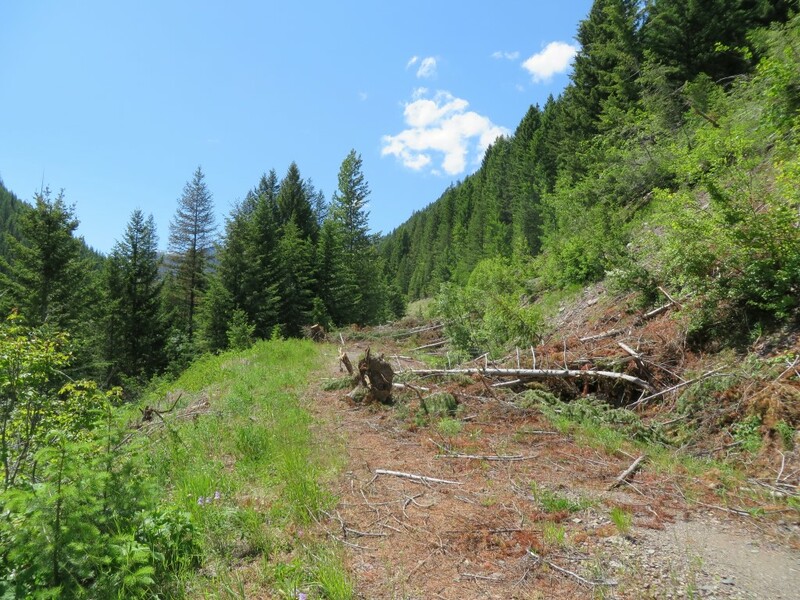 Bill made a presentation before the RAC committee on September 16 to ask for funding for trail maintenance for the stretch of trail between the Whitefish Divide Trail and the end of Hay Creek Road. 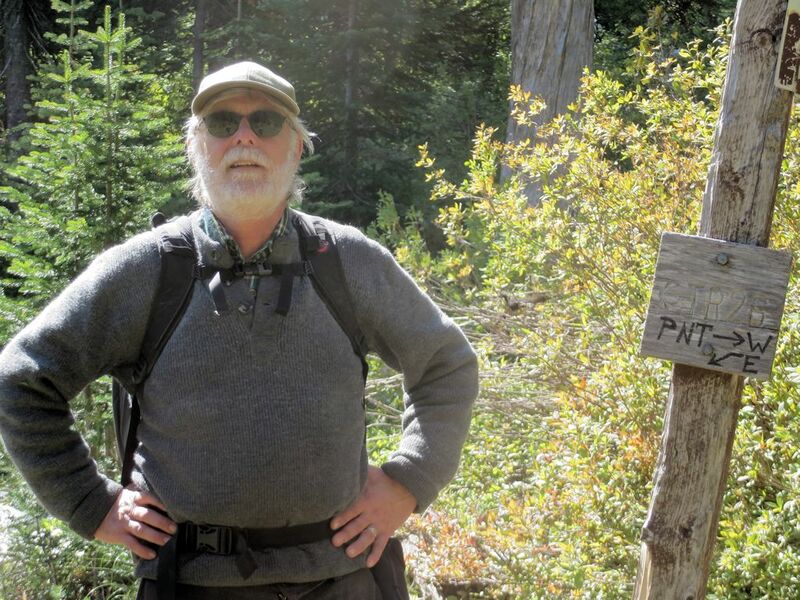 In preparation for his presentation before the RAC committee, Bill organized a group Saturday, September 13, to hike this section from two different directions. 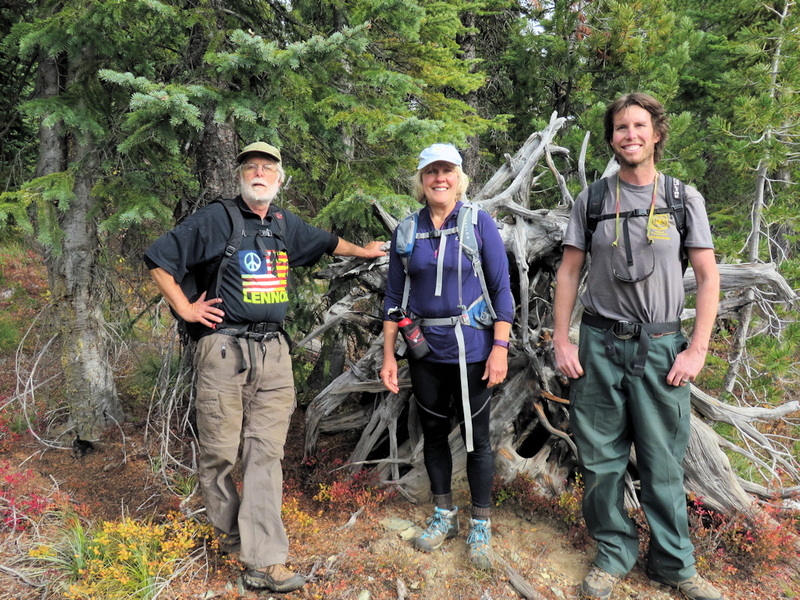 Bill and Randy Kenyon hiked from Hay Creek Road while Margaret Heaphy, Betsy Holycross, and Debo Powers hiked from Red Meadow Road on the Whitefish Divide. When the two groups met, they exchanged car keys thus avoiding the need for a shuttle. 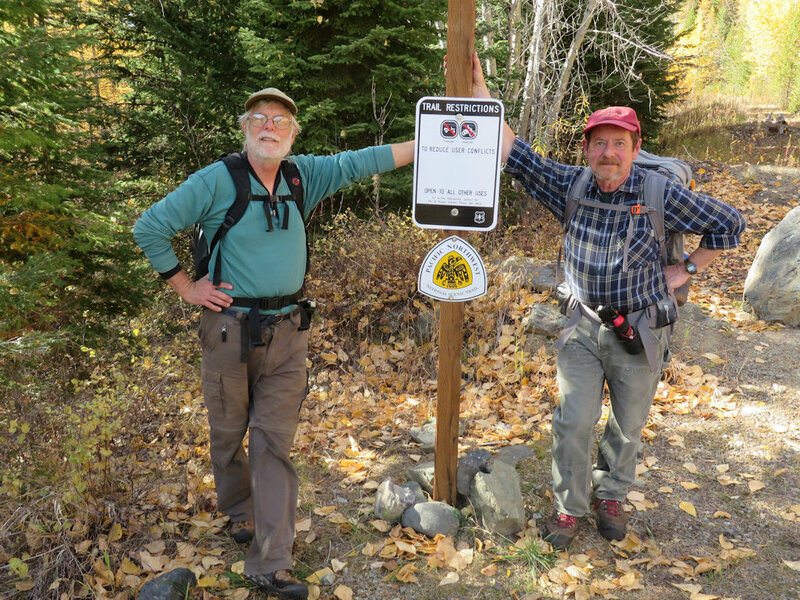 On Thursday, September 18, Bill transported NFTA scouts (Margaret, Betsy and Debo) to the Whitefish Divide trailhead on Red Meadow Road. 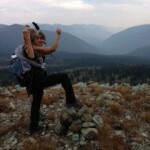 Their mission was twofold: (1) hike along the Whitefish Divide Trail and find the junction with the Coal Ridge Trail and (2) reconnoiter the upper portion of the Coal Ridge Trail to find out if the trail was discernible. 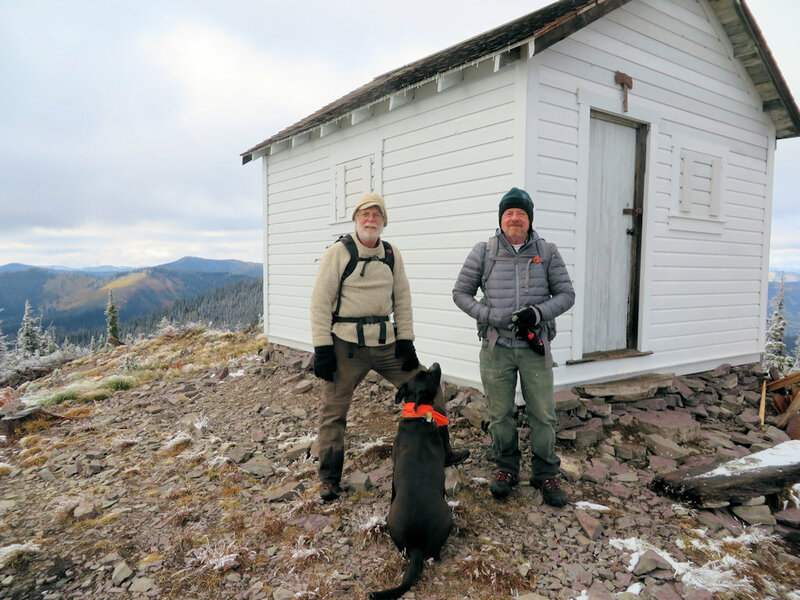 If the trail was passable and there was enough time for the long trek, the scouts would continue along Coal Ridge to the old lookout and patrol cabin and hike down to Hay Creek Road where Bill would pick them up. 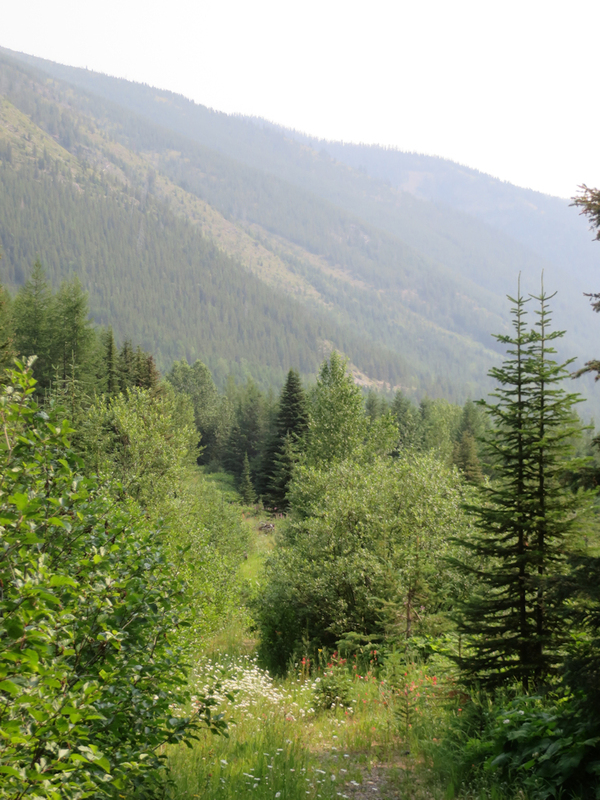 Although both parts of the mission were accomplished, the Coal Ridge Trail was so difficult to follow that the scouts returned the way they had come. 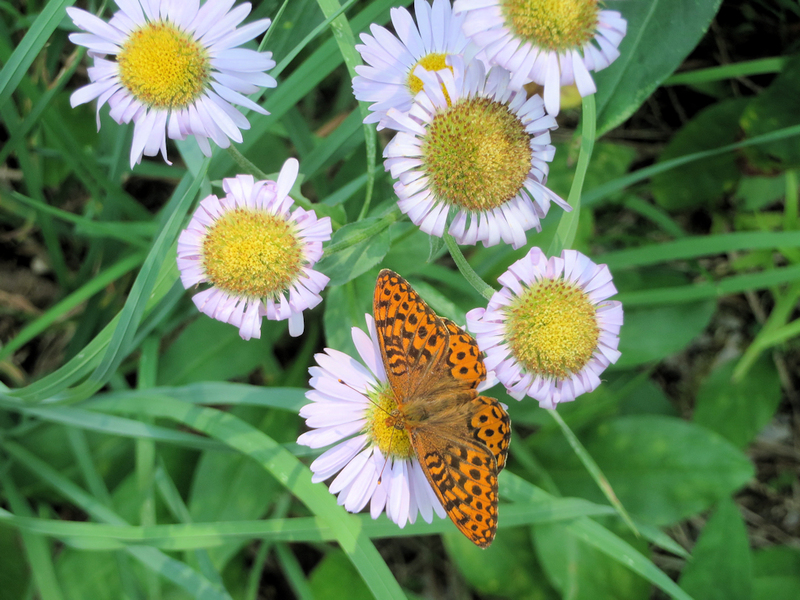 If you would like to donate money, time, or resources to help improve the hiking trails in the North Fork, please contact Bill through the NFTA “Contact” page. 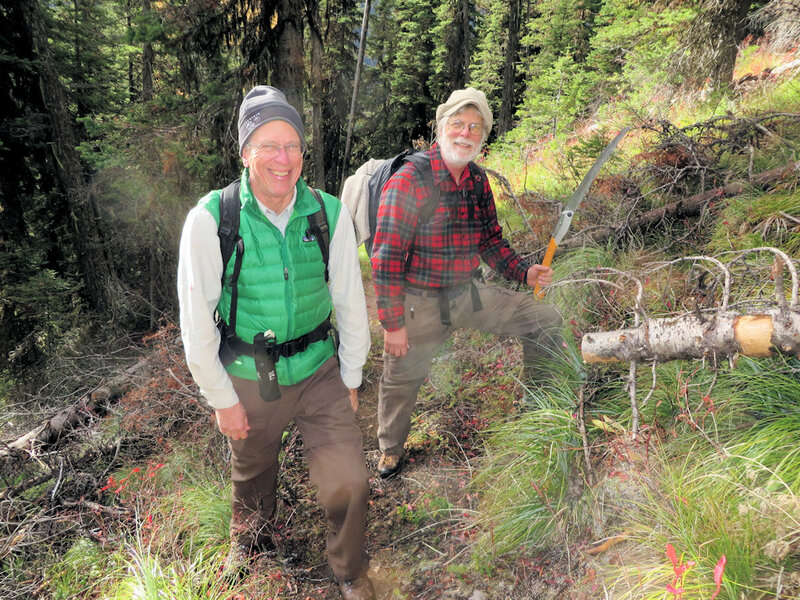 This entry was posted in Images, News, Trail Reports and tagged Coal Ridge, Debo Powers, Pacific Northwest National Scenic Trail, Ralph Thayer Memorial National Scenic Trail, Trail 14, Trail 26, Trail 3, Whitefish Divide on September 23, 2014 by Bill Walker. Trail 3 got a more thorough look July 21. I still didn’t have time to walk the entire length, but I did the first 4 out of about 5.5 miles. 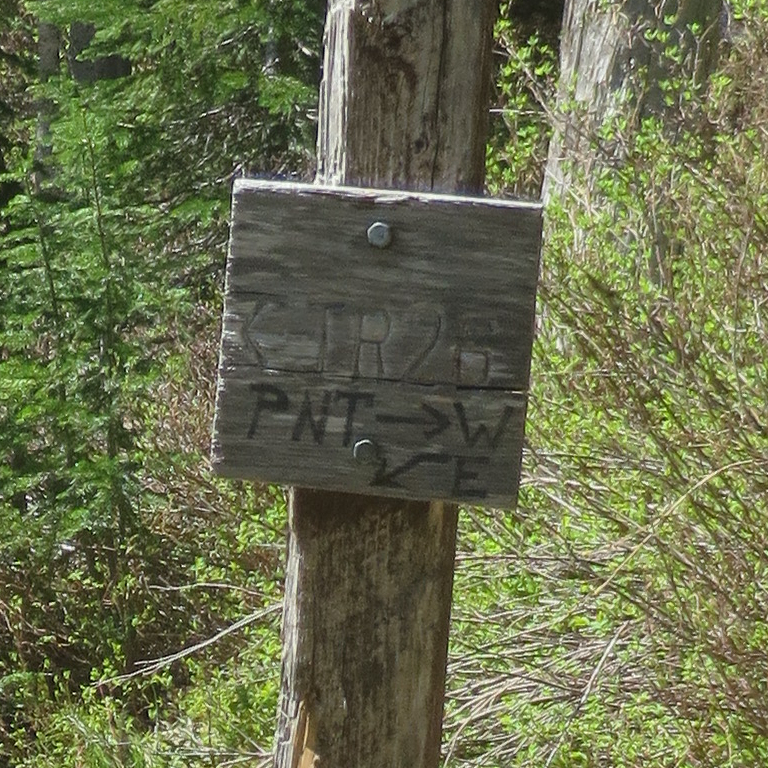 Trail 3, a segment of the Pacific Northwest Trail, continues west from the end of Hay Creek Road. Most of it is old roadbed, making it suitable for either hiking or bicycling. 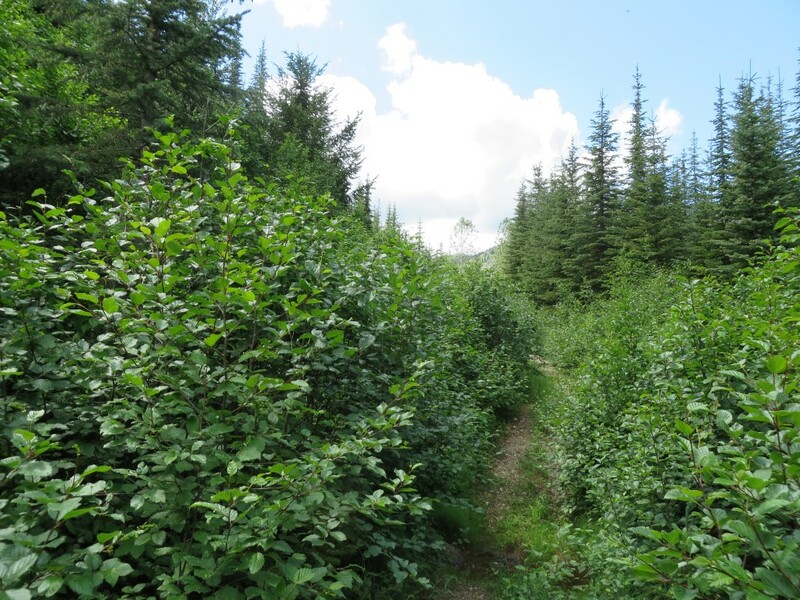 The trail is generally in good shape, although alder is starting to encroach on it where it passes close to Hay Lake. Trail 3 crosses Hay Creek perhaps a half-mile before the alders get really thick. The Forest Service conveniently left a very sturdy bridge in-place. The only real problem with Trail 3 is weeds. The first mile (starting from the eastern end at Hay Creek Road) has a heavy knapweed infestation. Just beyond mile 2, there is an extensive patch of orange hawkweed. 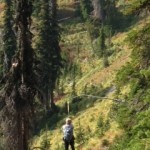 The Forest Service has been notified and likely will do something about this fairly soon. 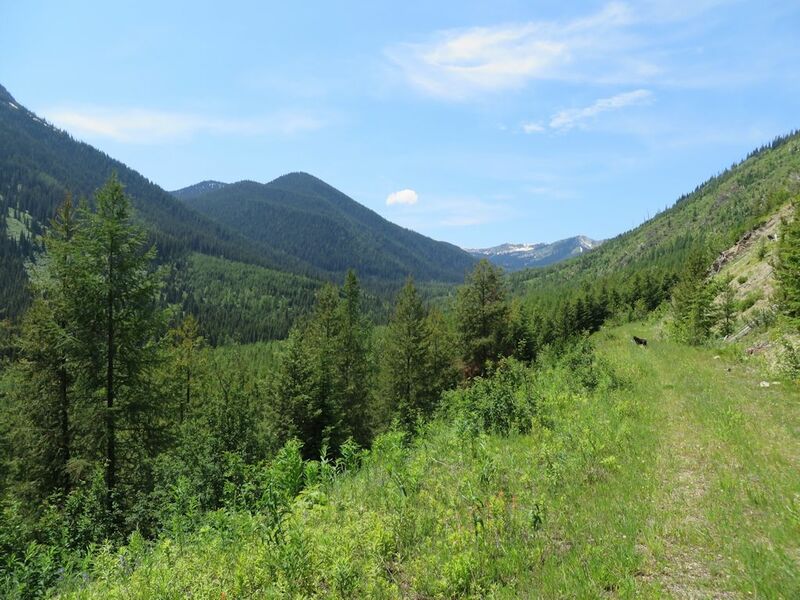 Overall, it is a nice trail, quite scenic in spots and providing ready access to the Whitefish Divide trail near its intersection with Red Meadow Road. This entry was posted in Images, Trail Reports and tagged alder, Knapweed, Orange Hawkweed, Trail 3 on July 24, 2014 by Bill Walker. 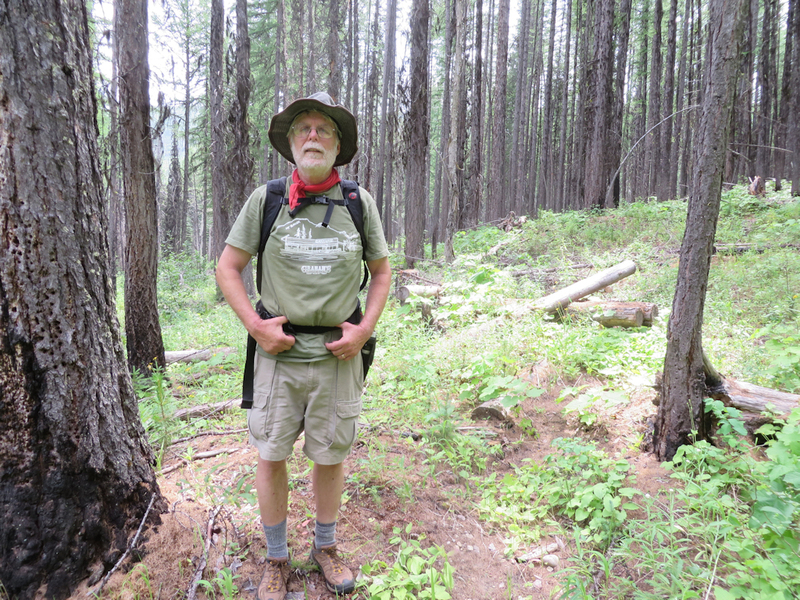 July 3, John Frederick and I took advantage of a nice day and open Forest Service gates to do the tour of the Coal Ridge — Hay Creek drainage area. 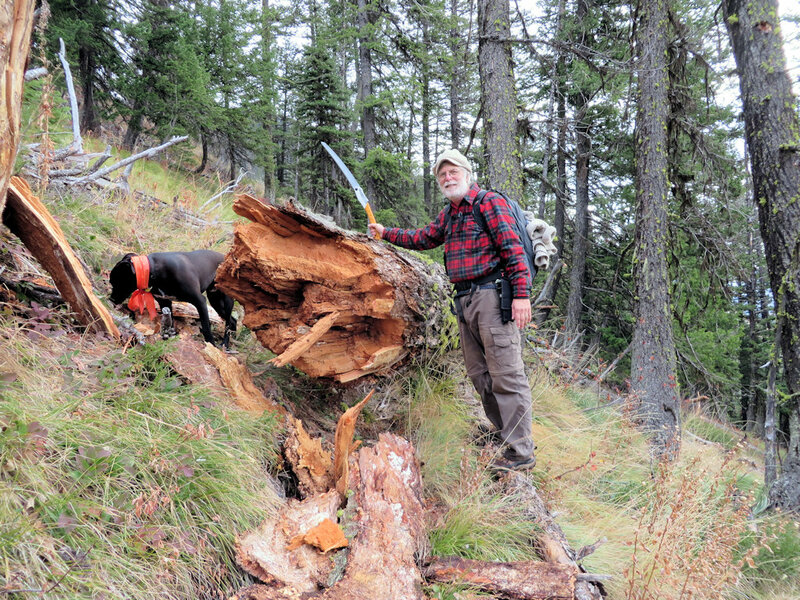 We went perhaps a quarter-mile up Trail 4 with the big chain saw, did a little clean up and then drove to the Trail 3 trailhead at the west end of Hay Creek Road. Trail 3, most of which is old roadbed, is in excellent shape for the first mile (and likely for at least another three after that). 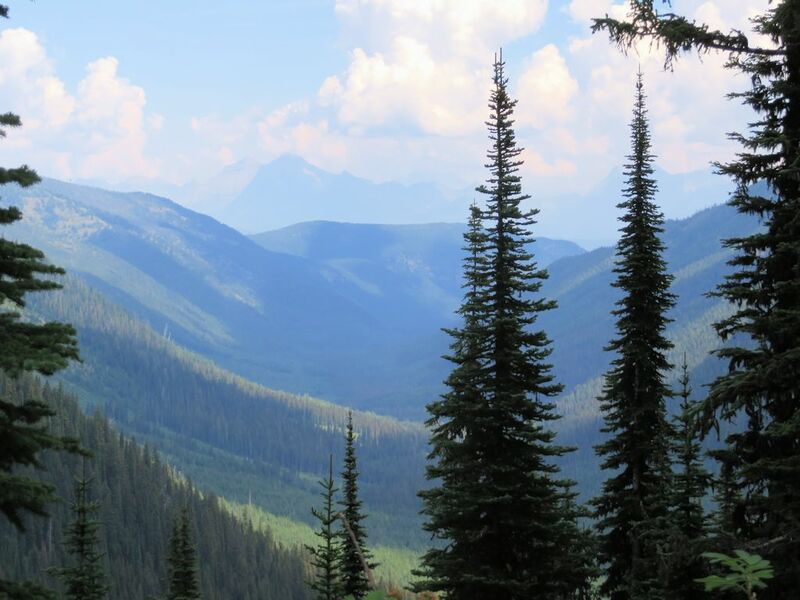 It offers a broad vista of the west end of the Hay Creek watershed, including the Whitefish Divide. Moran Basin Road (Road 5241), the last stop on our tour, has problems. We encountered a bad slide about two miles in where a collection of trees had slid down the bank, roots and all, spilling across the road. 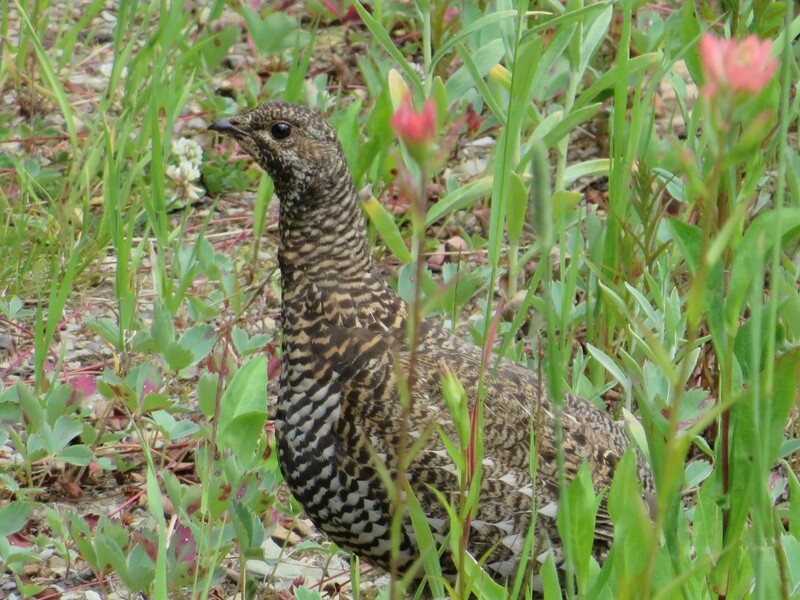 I cut out the first pile, but we encountered two more about a quarter-mile farther up the road. Until the Forest Service cleans this up, Moran Basin Road is navigable only by ATVs and bikes. Update: By July 8, the road was open. Someone (not the Forest Service) had removed enough debris to allow passage by regular vehicles. This entry was posted in Images, News, Trail Reports and tagged Hay Creek Road, Moran Basin Road, Trail 3, Trail 4, trail maintenance on July 5, 2014 by Bill Walker.